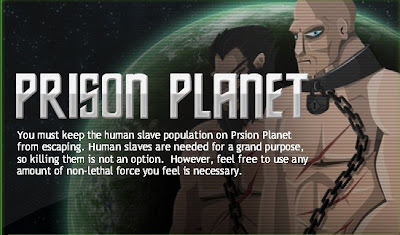 Prison Planet is another strategic point and click defense game on mofunzone. The game sets in a far, far away planet where human prisoners are needed for a grand purpose. Apparently, they are try to escape and it is your duty to stop them, but killing them is not an option so you will have to use stun guns and staffs to take them down instead. Controlled entirely by mouse, you have to strategically place guards around to intercept escaping prisoners. You will earn points for every human you take down and can use it to make upgrades on your guards weapons. Also make use of the teleport ability and attack dog to your advantage. Tip: Sometimes, these two abilities are just what you need to beat specific levels in the game. Meanwhile, here is PP Prison Planet walkthrough for level 2 reactor room. I have two questions for you, The video was running a little jerky, was the actual game play on your machine that slow, or was you video recording software just dropping frames?